Purrfect slot's title has the obvious play on the word that indicates nice fluffy cats and on that score the fans of felines will not be disappointed. Like WMS's OMG! Kittens or IGT's Kitty Glitter you are faced with many of your fluffy favourites here, although the game itself reminds me more of IGT's Cats. 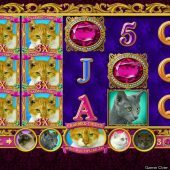 With nice jaunty music and a variety of miaows when landing any cat wins, will Purrfect nuzzle playfully with you or leave a nasty scratch? There are 40 pay lines over 5 reels of 3 rows each and the symbols are stacked. You have Wilds also stacked on the last 4 reels and each spin you will find that one symbol is 'Super Stacked' and it will obvious which one as the reels spin. You pay 40 coins per spin and the best paying 5-of-a-kind are the Siamese paying 50 coins, the Grey 40, the White 30 and the Ginger 20 coins. The remaining icons are the card values paying 15, 14 and so-on down to 11 coins for the 5. There are gemstone scatters on the centre 3 reels which when all land will trigger the game's free spins bonus. In the base game the Ginger Cat is the 'charmed choice' symbol and is overlaid with a 3x multiplier for any winning lines through them. Any wins consisting of 3 or more full reels of any cat will also show a real cat video clip while counting up, a nice touch if you like that sort of thing. The 3 Gemstone scatters award 7 free games that are non-retriggerable. Before these one of the Cats is selected as the 'charmed choice' for the 3x multiplier overlay. You play these out on reels with enhanced stacks and symbols too, increasing the poor pays of the base game. A screen full of queens for example pays 13x stake! The maximum pay is a full screen of Siamese with 3x overlay paying 600x bet.